THE WORLD'S BEST DELAY PEDAL! The Replica delay from T-Rex Engineering has won so much praise and received so many great reviews, it's hard to know where to start describing what's made this pedal such a phenomenon. Is it the perfect mix of controls, the ingenious tap control feature, the astonishingly warm tone? Replica delivers everything the most demanding guitarists could want in a delay -- which is probably why guitar heroes such as Carlos Santana, John Mayer, Greg Lake, Steve Morse and Pete Townsend rely on the Replica to help deliver their sound. One of the Replica's most brilliant features is its toggle-switch tap control. To set your delay rate to the tempo of the song you're playing, all you have to do is to tap to the beat. This keeps your delay in time even as you change tempo -- slowing down at the end of a song, for example. It really takes delay control to the next level. 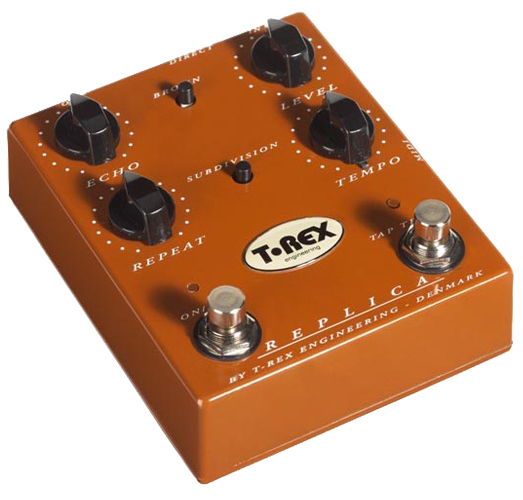 Warm, analogue tone Like everything T-Rex makes, the Replica is a musician's pedal, built by and for musicians with just one thing in mind: incredibly tone. The first time you hear the Replica, you won't believe your ears. It delivers a tubey warmth that brings out the best in your natural tone, without taking the upper hand by adding too much colour. With a simple flick of a switch you can alter the delay's subdivision parameter from 1/4 to 1/8 triplets, and to make the delay fit your purpose we even added a Tap-Tempo switch to get you right in time with your tune.